This collection of papers, written over the last six years by Robert Caper, focuses on the importance of distinguishing self from object in psychological development. 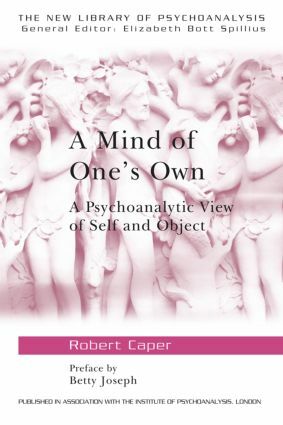 Robert Caper demonstrates the importance this psychological disentanglement plays in the therapeutic effect of psychoanalysis. In doing so he demonstrates what differentiates the practice of psychoanalysis from psychotherapy; while psychotherapy aims to ease the patient towards "good mental health" through careful suggestion; psychoanalysis allows the patient to discover him/herself, with the self wholly distinguished from other people and other objects. Joseph, Foreword. Introduction. Psychoanalysis and Suggestion: Reflections on James Strachey's 'The Nature of the Therapeutic Action of Psychoanalysis'. Does Psychoanalysis Heal? : A Contribution to the Theory of Psychoanalytic Technique. On the Difficulty of Making a Mutative Interpretation. What is a Clinical Fact? Psychic Reality and the Analysis of Transference. Psychopathology and Primitave Mental States. Play, Creativity and Experimentation. Internal Objects. A Mind of One's Own. On Alpha Function. A Theory of the Container. Bibliography. Index. The New Library of Psychoanalysis is published by Routledge Mental Health in association with the Institute of Psychoanalysis, London. Its purpose is to facilitate a greater and more widespread appreciation of psychoanalysis and to provide a forum for increasing mutual understanding between psychoanalysts and those in other disciplines. The series also aims to make some of the work of continental and other non-English speaking analysts more readily available to English-speaking readers, and to increase the interchange of ideas between British and American analysts. The New Library of Psychoanalysis published its first book in 1987 under the editorship of David Tuckett, later followed by Elizabeth Bott Spillius, Susan Budd and Dana Birksted-Breen. A considerable number of Associate Editors and readers have assisted the editors. Under the guidance of Foreign Rights Editors, a considerable number of the New Library books have been published abroad, particularly in Brazil, Germany, France, Italy, Peru, Spain and Japan. The aim of the New Library of Psychoanalysis is to maintain the high level of scholarship of the previous series, to provide a forum for increasing understanding between psychoanalysis and other disciplines and to increase the interest of the general book-reading public in psychoanalysis. The New Library of Psychoanalysis also aims to help the various schools of psychoanalysis to better understand each other. It has published books representing all three schools of thought in British psychoanalysis, including a particularly important work edited by Pearl King and Riccardo Steiner, expounding the intellectual and organisational controversies that developed in the British psychoanalytical Society between Kleinian, Viennese and 'middle group' analysts during the Second World War. The New Library of Psychoanalysis has also translated and published several books by Continental psychoanalysts, and it plans in the future to continue the policy of publishing books that express as clearly as possible a variety of psychoanalytic points of view.